You will tumble head over heels for this leaning tower of clay pots. A cinch to create and ultra frugal to make, this unique garden planter commands a second look. 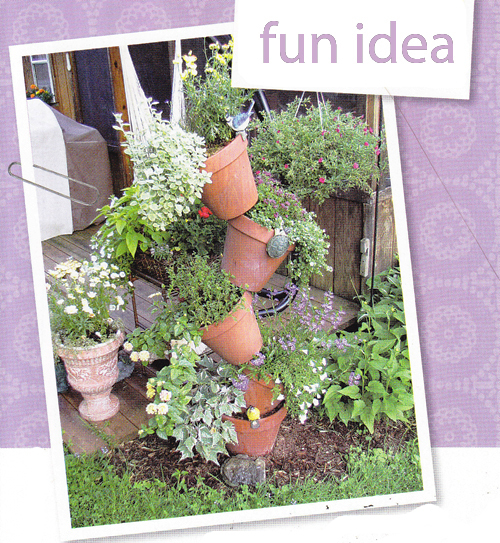 Fill the clay pots with herbs or colorful ornamentals and create a unique display. Pick a level spot in your garden area. Drive a 66" piece of re-bar 2 feet into the soil. Surround the base with newspaper to prevent weeds from growing. Then place a 12" round clay pot at the base, threading the re-bar through the drain hole. Fill the pot with soil so that the next pot has something to rest on. Press the soil down and water till firm. Take a 10" terracotta clay pot, tilt it so one side of the base rests on the soil below. Thread the next 3 pots and tilt them in opposite directions so the weights are distributed evenly. 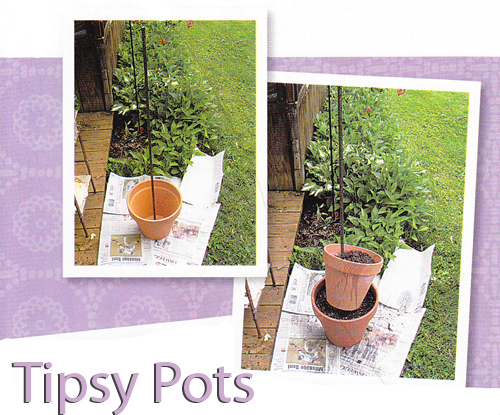 Add plants to the tipsy pots. Make sure to leave 1 1/2" space at the top of each pot. That way, when you water, the soil won't run off. Finally add a layer of much over the newspaper on the ground. Now, enjoy watching your flowers bloom!